The impact that Roland Corporation has had on our listening habits extends beyond its acclaimed digital music products. The company has also furthered the careers of some of the most influential new bands with its popular Roland Sessions. The video recorded live sessions have helped drive emerging stars like Twenty One Pilots and The Neighbourhood to new heights. 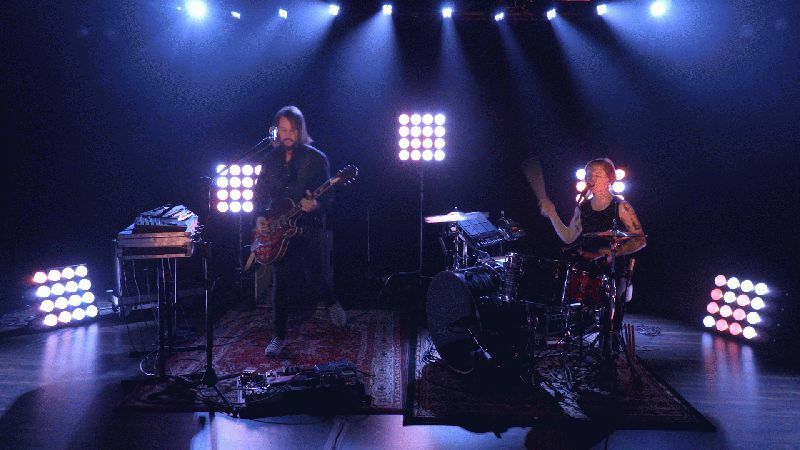 History is on the verge of repeating itself with the latest Roland Session, which features the indie rock duo MOON performing “I Got A Fever,” a raw hard-driving love song that is rapidly capturing the attention of critics and fans throughout the US. Doing justice to the group’s big sound and gritty beats is a compact, but hard-punching lighting rig featuring Nexus 4x4 panels from CHAUVET Professional. Justin Preston of Three-Phase Productions used five of the COB LED panels mounted on stands and the floor to form a semi-circle around band members: singer/drummer Chelsea Davis and guitarist/keyboardist Dan Silver. “MOON is made up of two people, so I knew I wanted to take advantage of the extra space on stage that I don’t normally get to work with at these sessions,” said the lighting designer, who has worked on multiple Roland Sessions in the past. At the same time, however, Preston also wanted to maintain a healthy amount of negative space behind the band to make the small (roughly 1,000 square foot) stage seem larger. Most importantly, though, alternating negative space with the high impact Nexus panels helped him create the kind of starkly powerful look that matched MOON’s sound. In the end, Preston met this goal in flying fashion -- giving MOON a look that fit the character of their music and helped brandish their image at a pivotal point in their career.